In this lesson, we will learn how to subtract two three-digit numbers by using partial difference. We will clarify these concepts in word problems. Find 5 3 − 8 by breaking apart ones. Hint: Think about what numbers will go in the circles when you break apart 8. 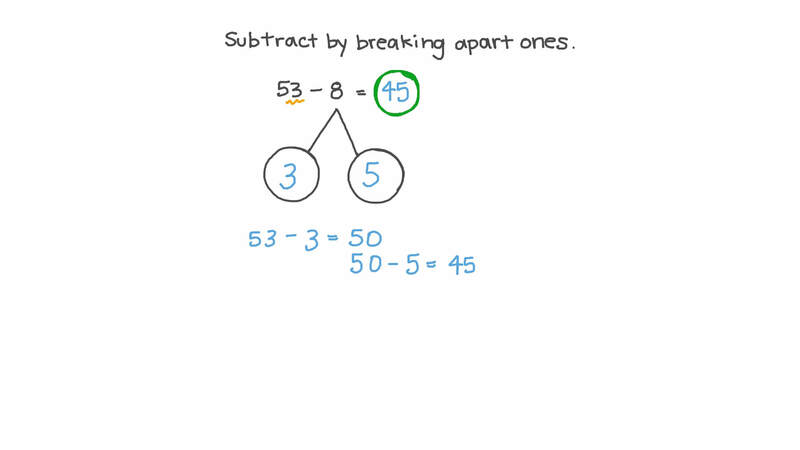 We can break apart numbers to subtract as shown. First, subtract to get 60. How many ones do we take away? Now, subtract the rest of the ones. What is 6 2 − 6 ? Elizabeth is subtracting 27 from 53. She breaks apart 27 so she can take away in three easy steps. First, she took away the tens. What number did she get? Then, she took away the ones. Help her finish the calculation. What is 5 3 − 2 7 ?